Candidemia is a significant source of systemic fungal infections, with Candida glabrata (C. glabrata) becoming prominent in recent decades. We describe a unique case where postoperative urinary retention and C. glabrata UTI led to invasive fungaemia with bladder necrosis. A 37- year-old previously well nulliparous woman underwent an elective diagnostic laparoscopy, hysteroscopy dilation and curettage, and dye studies for investigation of infertility. She re-presented six days post procedure with C. glabrata urosepsis with a subsequent laparoscopy on day 16 revealing fungal plaques in the bladder, and a large necrotic defect in the bladder dome. The patient was managed with bilateral nephrostomies, a pelvic drain and antifungal therapy. Four weeks post-insertion of the nephrostomies, a cystogram revealed spontaneous closure of bladder defect. The nephrostomies were removed and antibiotics and anti-fungal continued for a month until negative urine cultures were attained. The patient was well four months after discharge with mild urinary symptoms. The literature has reported two cases of candida UTIs resulting in bezoars and bladder rupture, occurring only in immunocompromised patients. This case highlights the challenges of C. glabrata sepsis and its potential for severe morbidity in a nonimmunocompromised patient, suggesting the need for guidelines in the early detection and treatment of C. glabrata sepsis. Candidaemia accounts for 75% of all systemic fungal infections and is associated with a mortality rate of 30% to 60% [1,2]. Although Candida albicans (C. albicans) is still the most common cause, in the past two decades there has been a rise in non-albicans candidaemia . Candida glabrata (C. glabrata) is the most common non-albicans species, and colonises the oropharyngeal and gastrointestinal tract. It is estimated that C. glabrata accounts for 11% to 16% of all candidaemias . This case report examines a unique case of post-operative C. glabrata candidaemia in an immunocompetent individual. A 37 year old nulliparous woman presented to Monash Health for an elective diagnostic laparoscopy, hysteroscopy, dye studies and D&C for investigation of recurrent implantation failure with IVF. Fertility investigations suggested evidence of low ovarian reserve and no male factor infertility. Significant past medical history was limited to mild intellectual disability. The diagnostic laparoscopy was normal with no evidence of a pelvic cause for her infertility, however, hysteroscopy was complicated by a right posterior uterine perforation, which was managed conservatively. The patient was given intraoperative cephazolin and metronidazole and discharged day one post-surgery on oral amoxycillin and clavulanic acid. The patient presented to a different hospital day two post procedure with left lumbar pain and no associated urinary, bowel or infective symptoms. On examination, she had a lowgrade temperature of 37.5°C and was tender in the left lumbar region with no signs of peritonism. Full blood count (FBE), serum electrolytes, renal function, c-reactive protein (CRP), urine dipstick and abdominal X-ray were unremarkable and as such the patient was observed and discharged home with paracetamol/codeine (500 mg/30 mg) The patient represented day six post laparoscopy, to the same hospital, with worsening abdominal pain, fevers and altered mentation. Clinical examination and investigations revealed evidence of urinary retention, sepsis and acute kidney injury (Creatinine 752, eGFR 10). An in dwelling catheter was inserted, ceftriaxone and metronidazole commenced and the patient was transferred to Monash Health, the primary treating hospital. A septic screen revealed evidence of C. glabrata in both blood and urine cultures. Subsequent investigations revealed a normal non-contrast CT abdomen, CT intravenous pyelogram, pelvic ultrasound, transesophageal echocardiogram and no evidence of ophthalmic seeding. The patient was commenced on micafungin under consultation with the infectious disease department and showed signs of clinical improvement with defervescence and normalisation of renal function. One-week post admission the patient showed clinical signs of deterioration with abdominal pain, low-grade temperatures and rising inflammatory markers (white cell count (WCC) 20, CRP 207). 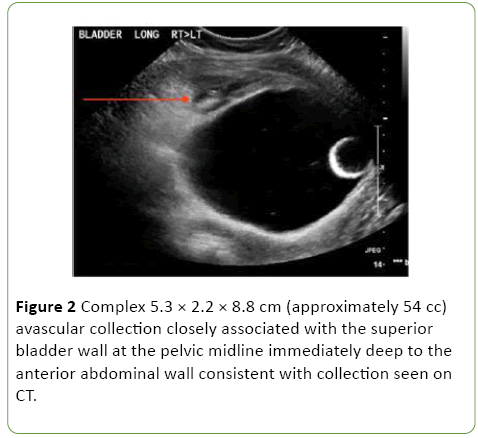 Repeat CT abdomen/pelvis and pelvic ultrasound revealed a new 8 cm space of retzius collection adjacent to the bladder (Figures 1 and 2). 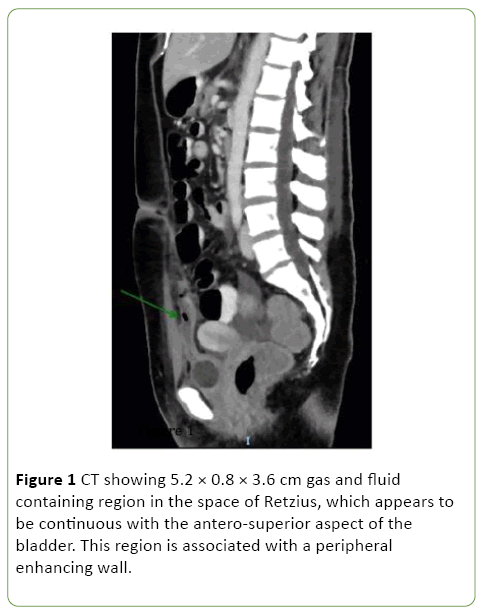 Figure 1: CT showing 5.2 × 0.8 × 3.6 cm gas and fluid containing region in the space of Retzius, which appears to be continuous with the antero-superior aspect of the bladder. This region is associated with a peripheral enhancing wall. Figure 2: Complex 5.3 × 2.2 × 8.8 cm (approximately 54 cc) avascular collection closely associated with the superior bladder wall at the pelvic midline immediately deep to the anterior abdominal wall consistent with collection seen on CT.
As a result she was commenced on Vancomycin, Tazocin and Fluclonazole for additional broad-spectrum cover. Despite this, the patient remained febrile with elevated inflammatory markers (WCC 15.4, CRP 143), worsening renal function (rise in Creatinine from 51 to 244 over one day) and progressive anuria. On day 10 post admission the patient was taken to the operating theatre with the assistance of urology and general surgery. Cystoscopy revealed evidence of fungal plaques covering the lateral walls and dome of bladder. A retrograde pyelogram was performed which showed evidence of wispy extravasation and a filling defect in the lower pole of the right kidney. Subsequent laparoscopy showed evidence of a large necrotic defect in the bladder dome, covered by omentum, with omental adhesions to the anterior abdominal wall (Figures 3 and 4). 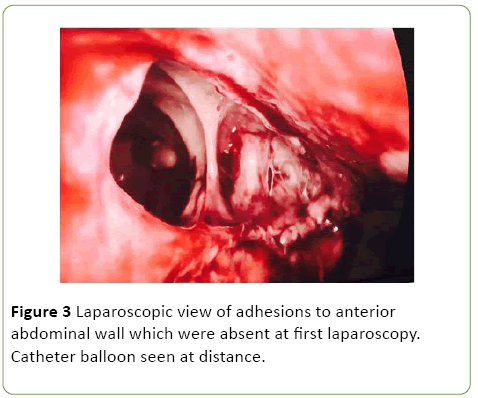 Figure 3: Laparoscopic view of adhesions to anterior abdominal wall which were absent at first laparoscopy. Catheter balloon seen at distance. 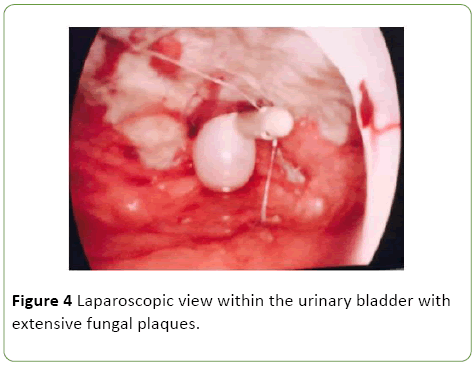 Figure 4: Laparoscopic view within the urinary bladder with extensive fungal plaques. In consultation with the urology team, the decision was made for conservative management and consideration of bladder reconstruction at a future date. Bilateral nephrostomies and a pelvic drain tube were inserted and the patient was transferred to ICU for monitoring where she continued antifungal therapy. The patient subsequently showed signs of clinical improvement with defervescence, improving renal function and urine output. However on day 13 post return to theatre, she again became febrile with new evidence of oral candida. A urine culture at this time revealed C. glabrata and Pseudomonas infection. As a result, the patient was switched to amphotericin and Tazocin, which then resulted in defervescence and resolution of oral candida, Candiduria and Pseudomonas UTI. Given the atypical postoperative course, we performed extensive investigations for an underlying cause of immunosuppression including HIV and hepatitis serology; ANA, ENA, dsDNA and complement; and lymphocytes, immunoglobulins, T cell, B cell, and natural killer cell counts. No cause of immunosuppression was identified. Four weeks post the insertion of nephrostomies the patient underwent a repeat cystogram, which showed no evidence of a filling defect suggesting spontaneous closure of the bladder defect. As a result the nephrostomy tubes were clamped and drain tube removed. The patient subsequently passed a trial of void and showed no signs of clinical deterioration. She did however develop increased urinary frequency and was commenced on oxybutynin, with good effect. The amphotericin and Tazocin were continued for one month with subsequent urine cultures showing no evidence of infection. The patient was discharged home with a plan for outpatient follow up by the infectious disease, urology and gynaecology teams. Four months after discharge, the patient remained well with mild lower urinary tract symptoms but no pain or infection. She will have ongoing follow up with the reproductive biology unit with regards to fertility. This is a unique case where postoperative urinary retention and C. glabrata UTI led to invasive fungaemia with bladder necrosis. Although we are uncertain of the sequence of events we speculate that the patient may have had a delay in diagnosis of postoperative candida UTI. This precipitated urinary retention and acute kidney injury, which predisposed the patient to invasive fungaemia and bladder necrosis. On review of the literature, there are two cases of candida urinary tract infections resulting in bezoars and subsequent bladder rupture [4,5]. The first case is of a 79 year old male with neurogenic bladder and an indwelling catheter who developed a C. albicans UTI which led to the formation of a bezoar and bladder rupture . This patient was managed with primary closure and antifungal therapy. Similarly, the second case is of a 40 year old male with diabetes mellitus, paraplegia and a long term indwelling catheter who developed emphysematous cystitis due to C. tropicalis . This again led to a bezoar formation and bladder rupture, which was managed with primary closure. Our case differs in that we report the first case of bladder rupture secondary to a C. glabrata UTI and sepsis, and in a healthy, nonimmunocompromised patient. Due to active infection, our management also varied from the aforementioned UTI cases in that we did not perform a primary closure. C. glbrata infection has also been reported as a cause of chorioamnionitis in healthy pregnant women [6-8]. The majority of cases appear to be reported in the IVF population and present at 15-24 weeks gestation. The authors propose that the possible source of infection is the lower genital tract, with introduction of organisms into the uterus at time of embryo transfer [6-8]. In the non-IVF population, C. glabrata chorioamnionitis has been associated with foreign bodies (cerclage and intrauterine devices) and immunosuppression (untreated gestational diabetes) . Pregnancy is also a state of relative immunosuppression where there is suppression of pro-inflammatory cellular responses and activation of antiinflammatory responses, which encourages embryonic implantation [9,10]. It is likely that this predisposes healthy pregnant women to candida infections. Again our case is unique in that it reflects C. glabrata infection in an immunocompetent non-pregnant individual with possible sites of fungal inoculation including the posterior uterine wall during the uterine perforation (although the infection found was in the anterior wall structures) and peri-urethral area through bladder catheterization. Candiduria is a common occurrence in hospitalised patients and is responsible for 10% to 15% of hospitalised UTIs [11,12]. The most common causes are C. albicans and C. glabrata and the main risk factors are bladder catheterisation and antibiotic therapy . Current guidelines recommend no treatment for asymptomatic Candiduria and treatment with antifungals for symptomatic individuals [14,15]. Complications such as candidaemia, fungal balls and pyelonephritis are rare in healthy individuals, which makes this case unique. Major risk factors for invasive candidiasis have been identified and can include both immune and nonimmune related causes. For instance, a study of 139 patients with C. glabrata candidaemia found that broad-spectrum antibiotics (88%), central venous catheters (77%), stay in ICU (48%), renal failure (46%) and total parenteral nutrition (45%) were significant risk factors . Furthermore, multivariate analyses have also shown that bladder catheterisation of any duration and surgery in general confers a 13 and 7.3 times increased odds of candida infection respectively [17,18]. Studies have also identified multiple genes that are associated with up to a 19-fold increase in risk of invasive candidiasis and also an increased risk of persistent candidaemia despite fungal therapy [19-21]. Risk factors in our patient that may have predisposed her to invasive candidiasis include intraabdominal surgery, bladder catheterisation, urinary retention, acute renal impairment and the use of broad-spectrum antibiotics. Furthermore, given the persistence and extent of the infection, it is also possible that she has an underlying immunogenetic predisposition and this perhaps warrants further investigation. The need for multiple antifungals and extended therapy in this patient also highlights the rising incidence of multidrug resistance and the challenge this poses to treatment. Studies have shown that C. glabrata has a 20% to 75% resistance toazole therapies and as a result guidelines no longer recommend Fluclonazole as first line management [14,22]. Whilst newer echinocandins are now used in preference, there also appears to be a rising resistance to these therapies with studies suggesting a 10% to 15% resistance rate in some institutions [14,22,23]. This poses concern for future management and mortality of C. glabrata candidaemia. Although multiple risk factors have been reported, there are no studies that have found a method of identifying the at risk population, making it difficult to determine who needs prophylaxis. Studies have examined the role of prophylaxis in neutropenic and solid organ transplant patients and have shown that within this population fungal-azole prophylaxis reduced the incidence of fungemia [14,24]. While guidelines already recommend prophylaxis in this at risk group, they do not encompass the wide spectrum of susceptible individuals. This is particularly relevant in the case of C. glabrata, which has a tendency to cause candidiasis even in the nonimmunocompromised population . Furthermore institution of prophylaxis in at risk population groups raises concerns of antifungal resistance. Certainly, there is some evidence that fungal prophylaxis has already contributed to resistance amongst non-albicans species . There is also evidence that prophylaxis with azole therapies has contributed to the rise in incidence of non-albicans fungemia, in particular C. glabrata species. Safdar et al. reports a high rate of C. glabrata infections post fluconazole prophylaxis, while Panackal et al. similarly suggests that C. glabrata candidemia affects patients with extensive previous azole exposure [27,28]. This case highlights the increasing prevalence of nonalbicans candidaemia, the challenges in its management and its potential for severe morbidity. Given that single risk factors such as surgery and bladder catheterisation are significant but would encompass a patient population too broad, multi-factor analysis within these populations on C. glabrata candidiasis specifically might reveal some insight. Australian guidelines are yet to exist on C. glabrata infections, but are much warranted given their mortality. Ho HL, Haynes K (2015) Candida glabrata: new tools and technologies-expanding the toolkit. FEMS Yeast Res15(6). Hirano R, Sakamoto Y, Kudo K, Ohnishi M (2015) Retrospective analysis of mortality and Candida isolates of 75 patients with candidemia: A single hospital experience. Infect Drug Resist 8:199-205. Fabry K, Verheyden F, Nelen G(2005) Infection of a total knee prosthesis by Candida glabrata: A case report. Acta Orthop Belg 71(1):119-21. Kumari P, Kan VL (2001) Bladder rupture attributed to Candida albicans Bezoar. Infect Dis Clin Pract 10(5):271-2. Comiter CV, McDonald M, Minton J, Yalla SV (1996) Fungal bezoar and bladder rupture secondary to candida tropicalis. Urology47(3):439-41. Jackel D, Lai K (2013) Candida glabrata sepsis associated with chorioamnionitis in an in vitro fertilization pregnancy: Case report and review. Clin Infect Dis 56(4):555-8. Sfameni SF, Talbot JM, Chow SL, Brenton LA, Scurry JP (1997) Candida glabrata chorioamnionitis following in vitro fertilization and embryo transfer. Aust N Z J Obstet Gynaecol37(1):88-91. Ozer E, Unlu M, Ersen A, Gulekli B (2013) Intrauterine fetal loss associated with Candida glabrata chorioamnionitis: Report of two cases. Turk PatolojiDerg29(1):77-79. Forrester JV, Xu H, Lambe T, Cornall R (2008) Immune privilege or privileged immunity? Mucosal Immunol1(5):372-381. Singh N, Perfect JR (2007) Immune reconstitution syndrome and exacerbation of infections after pregnancy. Clin Infect Dis 45(9):1192-1199. 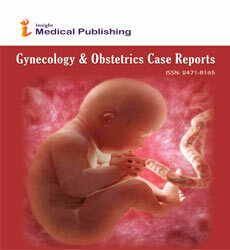 Kumar GS, Amar V, Ramesh B, Abbey RK (2013) Bizarre metal bezoar: A case report. The Indian J Surg75(Suppl 1):356-358. Sobel JD, Fisher JF, Kauffman CA, Newman CA (2011) Candida urinary tract infections: Epidemiology. Clin Infect Dis52 Suppl 6:S433-6. Kauffman CA, Vazquez JA, Sobel JD, Gallis HA, McKinsey DS, et al. (2000) Prospective multicenter surveillance study of funguria in hospitalized patients. The National Institute for Allergy and Infectious Diseases (NIAID) Mycoses Study Group. Clin Infect Dis30(1):14-8. Pappas PG, Kauffman CA, Andes DR, Clancy CJ, Marr KA, et al. (2016) Clinical practice guideline for the management of candidiasis: 2016 Update by the Infectious Diseases Society of America. Clin Infect Dis62(4):e1-e50. Fisher JF, Sobel JD, Kauffman CA, Newman CA (2011) Candida urinary tract infections: Treatment. Clin Infect Dis52 Suppl 6:S457-66. Gumbo T, Isada CM, Hall G, Karafa MT, Gordon SM (1999) Candida glabrata Fungemia. Clinical features of 139 patients. Medicine 78(4):220-7. Bross J, Talbot GH, Maislin G, Hurwitz S, Strom BL (1989) Risk factors for nosocomial candidemia: A case-control study in adults without leukemia. Am J Med87(6):614-20. Blumberg HM, Jarvis WR, Soucie JM, Edwards JE, Patterson JE, et al. (2001) Risk factors for candidal bloodstream infections in surgical intensive care unit patients: The NEMIS prospective multicenter study. The National Epidemiology of Mycosis Survey. Clin Infect Dis 33(2): 177-186. Kullberg BJ, Arendrup MC (2016) Invasive Candidiasis. N Engl J Med374(8):794-5. Kumar V, Cheng SC, Johnson MD, Smeekens SP, Wojtowicz A, et al. (2014) Immunochip SNP array identifies novel genetic variants conferring susceptibility to candidaemia. Nat Commun5:4675. Johnson MD, Plantinga TS, van de Vosse E, Velez Edwards DR, Smith PB, et al. (2012)Cytokine gene polymorphisms and the outcome of invasive candidiasis: a prospective cohort study. Clin Infect Dis54(4):502-510. Spellberg BJ, Filler SG, Edwards JE (2006) Current treatment strategies for disseminated candidiasis. Clin Infect Dis 42(2):244-251. Arendrup MC, Perlin DS (2014) Echinocandin resistance: an emerging clinical problem? Curr Opin Infect Dis27(6):484-492. Slavin MA, Osborne B, Adams R, Levenstein MJ, Schoch HG, et al. (1995) Efficacy and safety of fluconazole prophylaxis for fungal infections after marrow transplantation--a prospective, randomized, double-blind study. J Infect Dis 171(6):1545-52. Eggimann P, Garbino J, Pittet D (2003) Epidemiology of Candida species infections in critically ill non-immunosuppressed patients. Lancet Infect Dis3(11):685-702. Snydman DR (2003) Shifting patterns in the epidemiology of nosocomial Candida infections. Chest123(5 Suppl):500S-3S. Safdar A, van Rhee F, Henslee-Downey JP, Singhal S, Mehta J (2001) Candida glabrata and Candida krusei fungemia after high-risk allogeneic marrow transplantation: no adverse effect of low-dose fluconazole prophylaxis on incidence and outcome. Bone Marrow Transplant 28(9):873-878. Panackal AA, Gribskov JL, Staab JF, Kirby KA, Rinaldi M, et al. (2006) Clinical significance of azole antifungal drug cross-resistance in Candida glabrata. J Clin Microbiol 44(5):1740-1743.